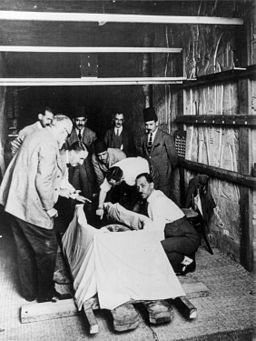 On January 3, 1924, Howard Carter discovered the sarcophagus [a coffin made of stone] of the Egyptian pharaoh Tutankhamen. He had uncovered the pharaoh’s tomb two years before, but there were many different chambers inside. Carter’s team cleared these chambers, stuffed with furniture, clothing, and other items, before they entered the actual burial chamber. In the first few chambers, Carter said he found “strange animals, statues, and gold—everywhere the glint of gold.” So many items filled the tomb that it took Carter ten years to record everything inside. The sarcophagus was considered the most spectacular discovery of Carter’s excavation. Finding a burial chamber of an Egyptian pharaoh still intact was a rarity already in the 1920s. Tomb robbers often tore coffins open because dead Egyptian rulers wore valuable jewelry under the mummy wrappings. Fortunately, Tutankhamen’s tomb remained hidden by debris from the excavation of another nearby tomb. Robbers didn’t have the chance to get this far into the tomb. Unfortunately, Tutankhamen’s body was in poor condition because of the ancient practice of pouring perfumes and oils over the mummy during the embalming process. Over time, the oils caused the pharaoh’s body to stick to the inside of the coffin. The golden mask covering King Tut’s face was also glued down; however, once Carter freed the mask with hot knives, he discovered that the mask had protected the pharaoh’s face. Thanks to this preservation, later scientists successfully performed an autopsy. The test suggested that the pharaoh died at age eighteen, perhaps of a head injury. Exactly how he died is still debated among Egyptologists. Theories range from murder to an accidental wound which doctors at the time could not heal.